In Columbus I did eat some good brisket at an authentic German deli called Katzinger's in the Germantown section where German immigrants settled generations ago. I also had some fairly decent Vietnamese food while I completed my adoption law exam in Columbus prior to leaving. 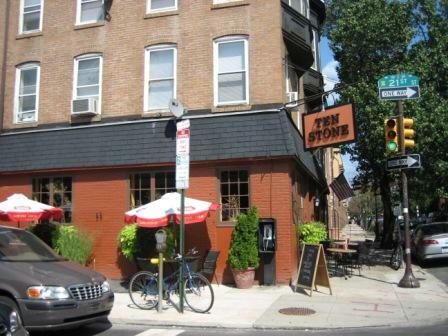 Back in Philly, I hit up Ten Stone, a nice bar/pub on S outh Street for a late lunch. I had a nice duck sandwich with berry sauce. On August 8 I left Philly for a quick stop in Williamsburg and then on to Charlotte. In Charlotte I ate with my mom and stepdad, Steve at Copper, a modern Indian restaurant. 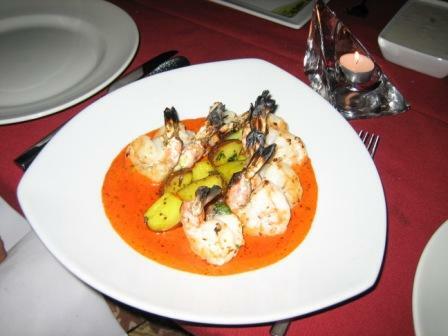 We had some fabulous shrimp and Steve had his favorite lamb dish. The next night my Dad, AKA Big Jon, took me to Nolen Kitchen, a newish restaurant that was voted "Best New Restaurant" in Charlotte by Creative Loafing's critics. I had a wonderful warm octopus salad and Dad had some yummy scallops served with pureed corn, asparagus and red peppers. For dessert we shared a strawberry shortcake with pink peppercorn ice cream! The ice cream was quite good, very creamy with a peppery kick. Finally, on Saturday August 12 I had some food native to Arequipa, Peru at an event hosted by the Charlotte Sister Cities organization. My dad's girlfriend Diane is a Board Member so we had to check it out! The food was awesome and I don't really know what I ate exactly but the hot peppers stuffed with ground beef, raisins and nuts were very spicy and extremely delicious! Columbus, Ohio - I am here taking a one week course in adoption law at Capital University. So far the course work is quite interesting and I have encountered some nice folks from law schools all over the country. The city (or shall I say town) of Columbus, on the other hand, has not impressed me so far! 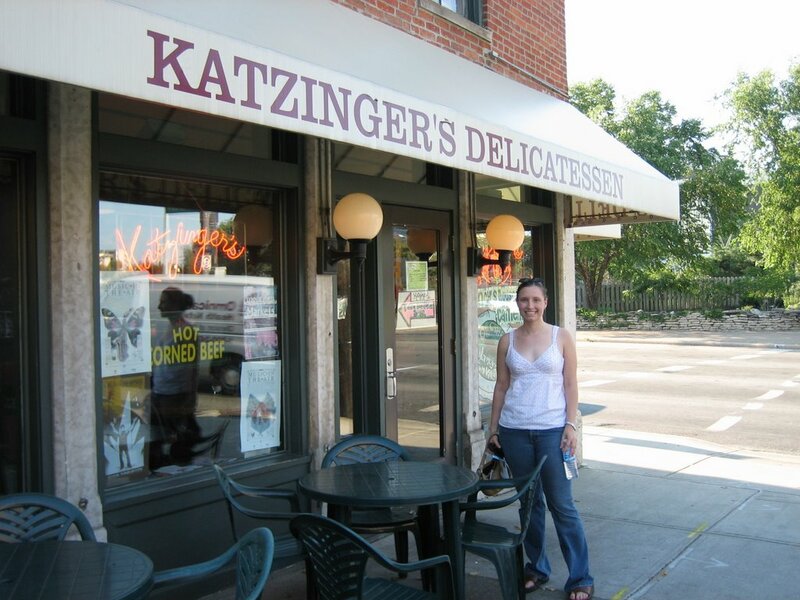 When I arrived on Sunday the downtown area was deserted and my roommate Jill and I had to walk several blocks just to find an open restaurant! We did end up finding a place called Ted's Montana Grill that had a respectable bison burger but geez - where is everybody?! The other neat place we visited is called North Market - a Reading Terminal market-like place with all kinds of food stalls. We had some delicious sushi there and also hit up Ben & Jerry's last night (sadly I had to get sorbet because of my lactose problem). Hopefully tonight I will get to German Village - supposedly a neat area so look for news of that soon! 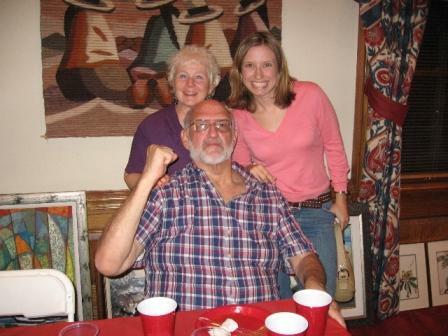 Also on July 27 I met my mom and stepdad at the fabulous Rose Tattoo Cafe for dinner. I had a feeling this place was going to be fabulous so I restrained myself at the earlier reception and resisted pigging out! I was definitely right. The Rose Tattoo is a neat place - the decor is much more beautiful than one might imagine for a place with "tattoo" in the title. It has a New Orleans flair, with plants throughout and multiple bars (one non-smoking). Apparently there is a neat upstairs seating area as well - I will have to check this out next time. My stepdad Steve had the mushroom bisque - very tasty - and the tuna special - rare ahi tuna pan seared over soba noodles served with broccoli rabe in a wasabi flavored jus. Always true to form, my mom got the duck breast, which was served with a blackberry sauce over a fried couscous cake. Since I was still a little full from lunch I ordered the grilled scallop appetizer served with smoked trout salad. The scallops were good but I was happy to receive tastes from both my mom and Steve since their dishes were downright awesome! Dessert was the best part. We shared a peach cobbler with ice cream and a mini-chocolate cream pie on an oatmeal cookie crust. 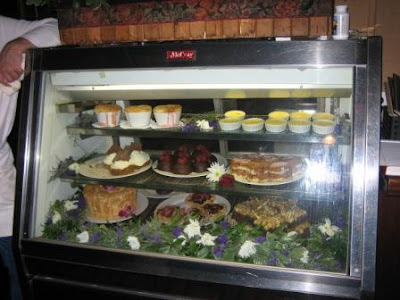 The cakey crust on the peach cobbler was scrumptious and the chocolate pie was almost as good as Grandma Sarah's. Yummy! Later on July 27 we headed over to one of the major law firms for a Public Interest Reception that was graciously hosted for all of the public interest interns in Philly. Wine, beer and some huge boiled shrimp made for a fun afternoon! I saw Sara and Marilyn from W&M and caught up on all the Marshall Wythe high gossip.